Opioid dependence is an issue that affects millions of people, not only those who are addicted but also their family and friends. Dependence can begin from legitimately prescribed medications that are eventually misused. This raises the issue of prescribing limits and the counseling that should accompany the use of opioids. 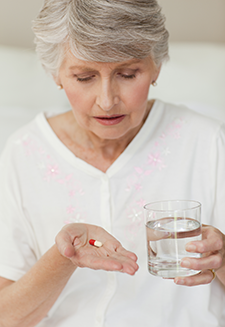 We may picture someone who is opioid dependent as a younger person, but older adults are also affected as nearly one-third have received a prescription for opioid pain medication in the last two years. This month's E-news Exclusive reports on the results of a major poll of older adults that shows elders favor protocols and procedures that will better ensure their safety, even if inconvenient. We welcome your comments at SWTeditor@gvpub.com. Visit our website at www.SocialWorkToday.com, like our Facebook page, and follow us on Twitter. Nearly one-third of older adults have received a prescription for an opioid pain medicine in the past two years, but many of them didn’t get sufficient counseling about the risks that come with the potent painkillers, how to reduce their use, when to switch to a nonopioid option, or what to do with leftover pills, a recent poll finds. But the poll also finds that nearly three-fourths of older adults would support limits on how many opioid pills a physician could prescribe at once. Even more supported other efforts to limit exposure to these medications and potentially combat the national epidemic of opioid misuse due to medication diversion. The new findings, from the National Poll on Healthy Aging (NPHA), suggest a major opportunity for providers and community organizations to focus on safe opioid use and safe disposal among older Americans. These findings also could help state and federal policymakers understand the views of a key demographic group at a critical time. Gulf War veterans with unexplained illnesses that cause fatigue, headaches, respiratory disorders, and memory problems can improve their balance with a device developed by Rutgers University researchers. The associated study is the first to examine how Gulf War illnesses affect veterans’ vestibular systems, which are integral for balance, memory, and brain blood flow. This prominent condition affecting Gulf War veterans includes a cluster of medically unexplained chronic symptoms that can also include joint pain, indigestion, insomnia, and dizziness, according to the VA, which supported the study. The disorder affects about 25% of the 700,000 veterans who served in Operation Desert Storm/Desert Shield in 1990–1991. “Although it’s been more than 25 years since the conflict, we still do not understand the underlying cause of these symptoms and have yet to develop an effective treatment,” says lead author Jorge M. Serrador, PhD, an associate professor in the departments of pharmacology, physiology, and neuroscience at Rutgers New Jersey Medical School and a scientist at the New Jersey War Related Illness and Injury Study Center. Have a product, service, or educational program you want to market to social work professionals, or an open position that you need to fill quickly? Social Work Today offers many flexible advertising programs designed to maximize your results. From print advertising to e-newsletter sponsorships, website advertising to direct mail opportunities, Social Work Today helps achieve your goals. Email our experienced account executives today for more information or call 800-278-4400! Coming up in our March/April 2019 issue is our Annual Education Guide. Email a sales representative to be part of this unique advertising opportunity. AlliedHealthCareers.com is the premier online resource to recruit social work professionals. Post your open positions, view résumés, and showcase your facility's offerings all at AlliedHealthCareers.com! Social Work Today's CE program offers social workers the opportunity to earn CEs from the comfort of their homes or offices. Visit www.SocialWorkTodayCE.com today and join the thousands of professionals from across the country who already have taken advantage of this great program. Simply read an issue of the magazine and complete the online exam. Most issue exams will earn 2 CE credits! PLUS, you have the opportunity to earn CE credits from past issues, too! According to NPR, MAT, considered to be the most effective treatment for opioid addiction, is being used by the Rhode Island Department of Corrections as part of a comprehensive treatment program for certain inmates. USA Today reports that alcohol causes 88,000 deaths annually, but because drinking, unlike smoking, still enjoys wide public acceptance, it is an undertreated problem. According to The New York Times, new research projects that effects of climate change across a broad spectrum of problems, including heat waves, wildfires, sea level rise, hurricanes, flooding, drought, and shortages of clean water, could happen at the same time by the end of the century in certain areas. The Washington Post reports that a North Carolina school where many families claim religious exemption to vaccines has been hit with the most serious outbreak of chickenpox in two decades. The nation's top employers and recruiters of social workers advertise in Social Work Today magazine and post their job openings on AlliedHealthCareers.com. Check out the most recent opportunities that have been submitted by employers across the country! Social workers care about their clients, but rarely do they have time to care about themselves. Show yourself a little appreciation with field-inspired gear from our Gift Shop. We've got the perfect item for every situation from busy days in the office to at-home visits. Check out our secure online shop today or call toll-free 877-809-1659 for easy and fast ordering.